Today we are on a mission to create happy moments for strangers which will last right through summer. We will be planting sunflower seeds all down the wire fence of two city wasteland areas near our home. And in several weeks time, there will appear seedlings and shoots followed by giant sunflowers smiling at everyone who passes and thinks, “how did those sunflowers get there?”. And this simple thing will bring smiles to hundreds of people and perhaps the wildly surprising sight of giant sunflowers, heavy with yellow petals and seeds will bring unexpected hope to fatigued minds. If you’re in the Northern Hemisphere get yourself a pack of Sunflower seeds for mere cents / pence, find a piece of twig to use as a dibbet (thing to make a hole in the ground for your seed) and plant your seeds in forgotten, abandoned or neglected areas. Plant either in the rain or after the rain when the soil is still wet. You will be surprised at the *thrill* guerilla gardening brings. Sunflowers, flower of children and simplicity, bees and butterflies, are easy to grow. Of course you might want to check the tiny plants now and again so you can feel your heart swell with the growing seedhead. If you plant your seed next to a wasteland fence you can tie the growing stems to the fence to secure them to stand tall. I’m sure you can see that quite apart from the simple joy you will bring to others, you are making a soulful statement about bringing simple joy to the world and actively planting seeds of happiness in those forgotten, abandoned or neglected areas of your heart. Guerilla gardening for the soul, planting seeds of boldness, you watching your happiness grow in the sunshine, giant sunflowers staked against wasteland fences,. It’s a beautiful thing. 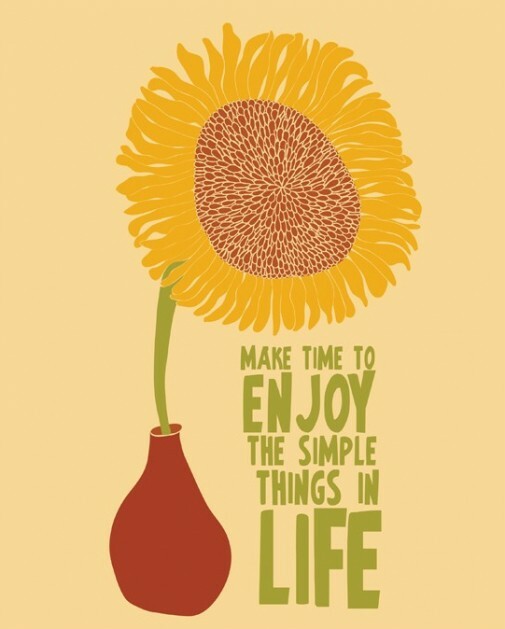 Image “enjoy the simple things” borrowed from Parada Creations. Available to buy. Will do, Flora. A lovely idea. ‘Twould be wonderful to have a map/images of where this is taken up. Positively HOT in Argyll for the first time this year. I love this random act of kindness, bringing joy to those who see the flowers but know not from whence they came! Beautiful and inspiring, what a splendid idea. Thank you for sharing the flower love!